Moving Memories, directed by Program of Dance and Movement faculty, Anne Harris Wilcox, is the culminating project of DAN 247*. This course brings together UR students and senior citizens from River Edge Manor, Senior Living Community (535 Mt. Hope Avenue), to participate in the artful mission of making dances. Senior partners and students have paired together to create performative pieces based on a significant memory from the elder’s past. Both parties have shared in all aspects of decision-making such as: topic, aesthetics, stage craft, choreography, narrative, abstraction, music, and more. In mini-workshops during the semester the groups have met weekly to explore elements of choreography such as space, time, energy, relationships, imagery, and abstraction to learn about the craft of choreography. The concert will feature six collaborative dances, with titles such as Goodnight, Irene, Voyage into Memory, and Yes, I Remember it Well. Following the performance, there will be a brief question/answer session followed by a celebratory reception. Featured in the concert will be works by River Edge choreographers: Carmen Casserino, Agnes Marshall, Betty Miller, Yve Parkes, Maria Staryzk, Ruth Turk, and Irene Waldorfer; University of Rochester choreographers: Michaela Pratt, Catherine Ramsay, Dayvi Sandoval, Da’Yana SeGears, Katherine Serna, and Helen Shammas. On Monday, April 29, the concert will be performed again at 10:30 am, for the River Edge Manor community at the River Edge Chapel. Moving Memories, has been three years in-the-making by Anne Wilcox and came to fruition by a generous course-development grant from the Rochester Center for Community Leadership at the University of Rochester. This grant enabled Wilcox to investigate how creativity has been used to promote well-being for elder populations at the local, national, and global levels. A highlight of Wilcox’s preparation was to participate in the Winter Intensive Institute at Dance Exchange, Tacoma Park, MD to deepen her understanding of intergenerational collaboration and performance. 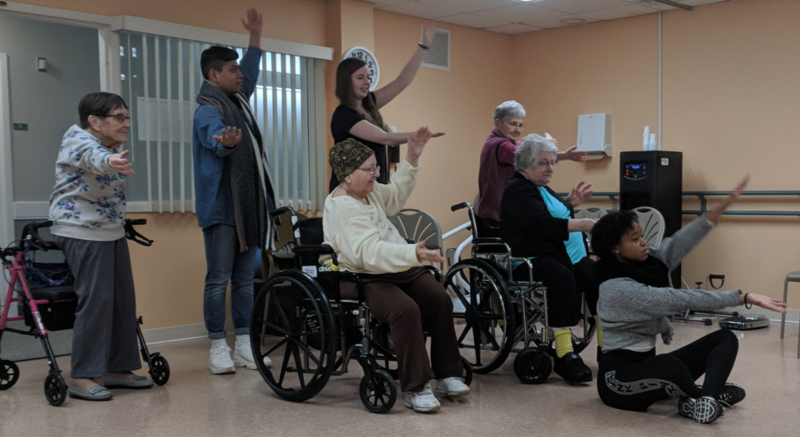 In preparation for partnering with River Edge elders, UR students worked with social workers and geriatric specialists to enhance their understanding of senior living and how dance and movement can create positive change and enhance quality of life. Wilcox and students researched the renown work of choreographer, Liz Lerman whose writing, choreography, and community collaborations have led the field in intergenerational dance for decades. Bonnie Gregoire, the Activities Director at River Edge Manor, worked hand in hand with Wilcox to coordinate, promote, and implement the Moving Memories partnership. For more information, please contact Anne Harris Wilcox, or the Program of Dance and Movement office.